In our daily review of financial media, we often see articles touting investments that allegedly will fare well when equity markets tumble. Gold is common, with many presuming the shiny yellow metal is an insurance policy against falling stocks. With plenty of periods of uncertainty in 2018 already, gold has been a popular suggestion for investors seeking alternatives to stocks. However, we disagree with these views. In our view, gold is a commodity that doesn’t possess any special powers, and we don’t think it makes much sense for investors who need long-term portfolio growth. Many theories we have encountered claim that gold is a good hedge against different market environments. In investing, a hedge is something you own to offset the risk from other holdings. For example, if you own stocks and their prices fall, a hedge should maintain its value or rise. In gold’s case, we have found many investors think gold holds up well during both inflationary times (i.e., prices are broadly rising) and deflationary times (i.e., prices are broadly falling). Some think gold is the asset to own when political uncertainty is high, during equity bear markets (fundamentally driven extended market downturns of -20% or more) or when calamity strikes. 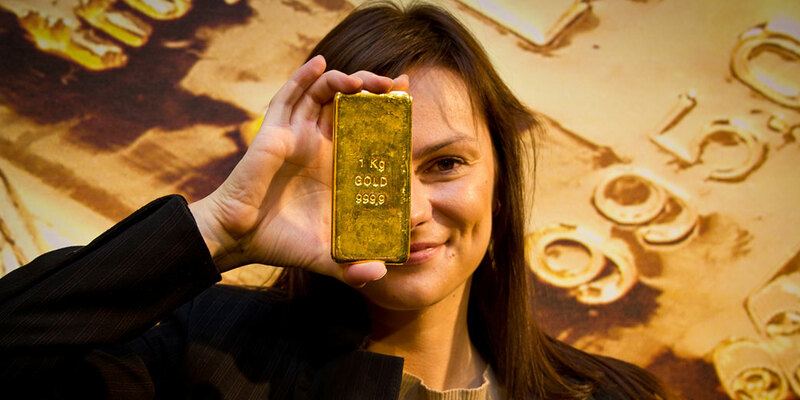 This presumes gold possesses many abilities as an investment! Don’t let the glimmer fool you: We don’t think there is anything special about gold. Strip away the shiny veneer, and gold is a commodity—the same category as copper, oil and pork bellies, only with arguably fewer practical uses. Commodity prices, like any other asset, depend on supply and demand. According to the World Gold Council—an organisation that tracks gold data and industry trends—gold supply continued growing in Q2.i With steadily rising supply showing few signs of abating, demand likely matters most for pricing. Source: FactSet, as of 5/9/2018. Dollar per troy ounce for gold, 31/12/1974 – 31/8/2018. US dollars are used since gold is globally priced in dollars on exchanges. The US officially ended its adherence to the gold standard towards the end of 1973, so we start the data on 31/12/1974 to bypass any skew from the transition. 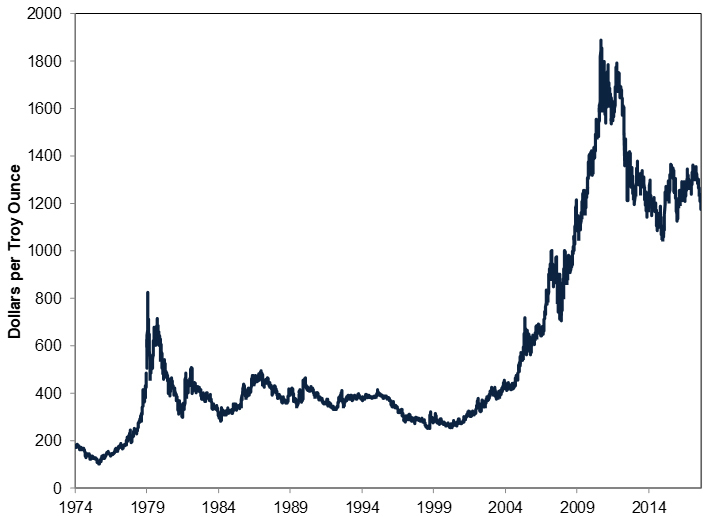 Gold enjoyed some big boom periods in the late 1970s and during this millennium’s first decade. However, for stock owners who think gold is a good hedge, these boom periods haven’t always corresponded with periods of equity weakness. During both the 2000 Tech Bubble and 2008 Financial Crisis, gold also experienced stretches of weakness as stocks fell. Besides being a poor stock hedge, gold itself has endured sharp pullbacks. A gold bear market started in September 2011, and it hasn’t meaningfully recovered yet. With supply ample right now, we think successfully investing in gold means pinpointing when investors’ emotions about the precious metal meaningfully shift. In our experience, this is a tall order that no market forecaster we are aware of has been able to consistently achieve. Contrast this with investing in stocks. Like gold, supply and demand affect stock prices. In the longer term, supply has a larger effect on prices, but in the near term, we think economic, political and sentiment drivers have the biggest impact. Notwithstanding their short-term volatility, stocks largely move in advance of the economic cycle. The economic cycle refers to the general tendency of an economy to expand and contract. Stocks, which represent ownership in publicly traded companies, can increase in value as companies generate profits and grow over time. We think it is possible to navigate markets by analysing the economic, political and sentiment drivers affecting investors’ willingness to pay for stocks. We don’t think the same case can be made for gold. The conventional wisdom continues to suggest gold as an investment, especially during volatile times. In our view, this stance is off. We don’t think gold is the ticket to generating long-term growth many investors require to reach their investment goals. Nor is it viable as a hedge versus shaky equity markets. That, to us, renders the case to own gold fairly flimsy. iSource: “Gold Demand Trends Q2 2018,” World Gold Council, 2/8/2018.